Lordosis is the term given when there is an exaggeration of the natural curve in the lumbar region of the spine, which creates an over-arched lower back. Some people are born with this condition but many people develop it over time. Factors such as poor use and posture, and the wearing of high heels can contribute to this condition. For instance, many pregnant women carry their 'bump' - their babies - with a very pronounced curve in their lower backs, which could often be reduced if they used their bodies differently. They may then go on to carry the baby in their arms in such a way that they continue to increase the lumbar curve and then they experience lower back pain. Lordosis can often result in the compression of the intervertebral discs between the lumbar vertebrae, causing lumbago and even the severe pain of a prolapsed disc (slipped disc). 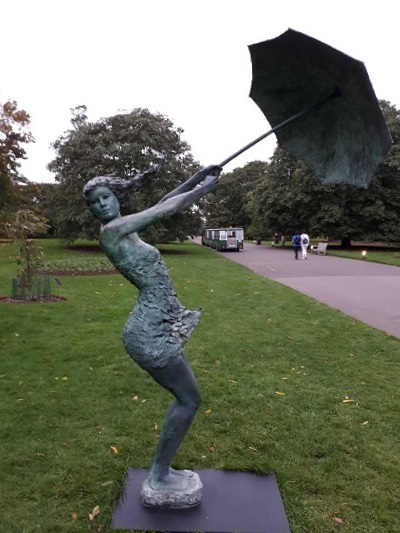 This sculpture at Kew Gardens shows a somewhat exaggerated lordosis in this young woman. In a real person, this pronounced arch may reduce when she stood upright or sat down, so the curve may lessen but frequenly, if this is a way of habitually using the body, it tends to get fixed so lordosis develops into a condition, not just an arching movement.